How do you make purchase decisions today? Cost? Availability? Reputation? Before long, it will be Customer Experience. According to Walker, by 2020 customer experience will be more important than even price for B2B buyers. You probably believe this, as the importance of “customer experience” is in the lips of every consultant, and in the pages of every business publication. But what does it really mean? What is “great customer experience” anyway? There may be more, but I believe there are three primary areas where you can exceed expectations, on the road to delivering great customer experiences. You can be faster than your customers expect, and create a great customer experience. Today, according to research I completed in conjunction with my new book, Hug Your Haters, among those expecting a response at all, 40% of customers who complain about businesses in social media expect to hear back within one hour. The average time it takes businesses to get back to their customers in social media (if they answer at all): five hours. But what if you could answer your customers in five minutes? Discover Financial Services (makers of the Discover Card) routinely do this, and many other companies do the same. That kind of responsiveness exceeds expectations and creates great customer experiences. Don’t ignore other communication channels either. It’s remarkable that the average time it takes a business to respond to a customer email is 44 hours. Nearly two days to respond to an email! Recently, my wife needed to send her watch to Shinola for repair. She emailed them, and heard back from them in two minutes. It exceeded her expectations so much, she called me to make sure I knew about this great customer experience. 47% of Americans trust advertising, according to Nielsen. Almost every company has a trust deficit, because they are inauthentic in one (or many) ways. And trust deficits are expensive propositions. It turns out that one of the best ways to gain and keep trust is be unusually open and honest. It shocks customers into wanting to do business with your company. Why? Because you vastly exceed their expectations of how a company is supposed to communicate. Patagonia is magnificent at this. 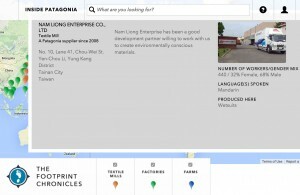 Their Footprint Chronicles microsite details every manufacturer and vendor in their supply chain, their labor practices, and other details. This authenticity and forthrightness creates a great customer experience, and changes the way readers of the Footprint Chronicles think about the brand. When someone says they are “too busy” that’s actually an obfuscation intended to not hurt your feelings. What they really mean is “what you are giving me is not relevant enough.” Because when you give someone content or an experience that is precisely what they need, when they need it, in the format they prefer….the time necessary to consume or engage magically emerges from thin air. We don’t expect companies to be massively relevant to us, because they so rarely are. But when they do deliver the relevancy goods, it smashes those expectations and creates a great customer experience. With Spotify being new to Canada, I don’t really understand how to use it right, but damn, I like it. How’s that for a great customer experience that’s incredibly relevant? Can you be faster than your customers expect, more authentic than they expect, or more relevant than they expect? Doing so isn’t easy, because each of these require an increase in effort and an internal, cultural embrace of these methods. It is far easier to just keep delivering the same, average interactions that essentially meet customers’ anticipations of what you’ll do, when, and how. But isn’t exceeding customer expectations worth the investment? The companies cited in this post certainly think so, because they know it’s the recipe for what will soon become the key differentiator in business – more so even than price – great customer experience.